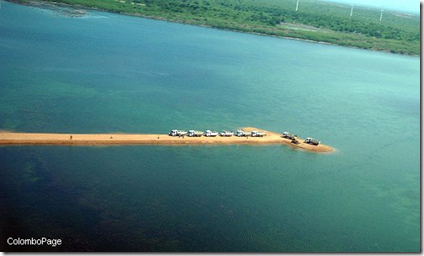 A new sea port, Hambantota at the southern end of Sri Lanka is being developed at a cost of one billion US$ by China. The Exim Bank of China is funding this project. The entire project is expected to be completed in 15 years in four phases. The first phase costing closer to $450 million.The port will be capable of handling 20 million twenty-foot equivalent units (TEUs) per year with 11 kilometres (km) of berths. 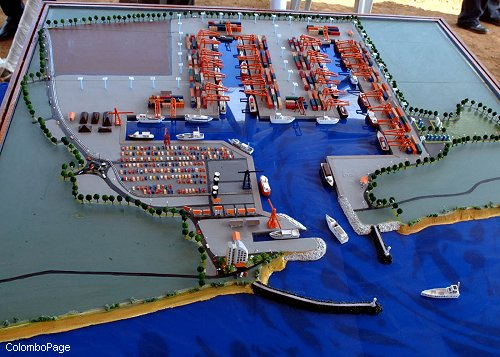 The agreement between the Sri Lanka Ports Authority and the Chinese Consortium for the development of the Hambantota Port was signed on March 12, 2007. 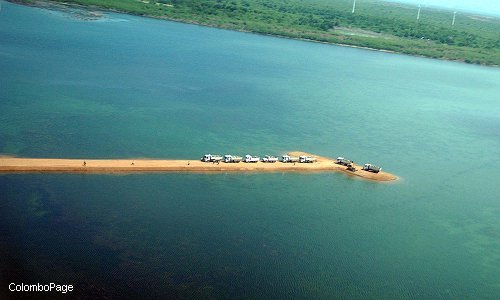 Work on the bunkering terminal is expected to start before December 2007, and is expected to be completed in 39 months. The plan caters for the terminal to handle up to 500,000 metric tonnes (mt) of oil products a year. Depending on the requirement the terminal can be further expanded up to one million mt. China is increasingly depending on oil import from middle east countries. The sea route for oil imports as shown in the map below is of great importance to China and China wants to have a control over this sea route. Sri Lanka, situated in the Indian Ocean is closer to the Marlaca Strait and has a strategic location for the protection of the oil route. 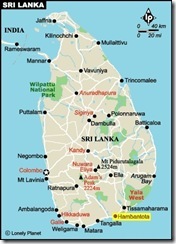 Hambantota is located at the southern end of Sri Lanka. On 31 October 2007, Sri Lanka President Mahinda Rajapaksa visited Hambantota Port Development Project site on an inspection tour. President addressed the gathering and greeted the Chinese engineers who are involved in the construction. President gave the signal to start the work at the site. Ministers Chamal Rajapaksa, Dinesh Gunawardena and Chinese Ambassador Ye Tabo were also present at the occasion. Read more from Sri Lanka – Current Affairs: Hambantota – the new hub of development. OldSailor wishes all the best for the timely completion of the project. “China has given massive aid to Indian Ocean nations, signing friendship pacts, building ports in Pakistan and Bangladesh as well as Sri Lanka, and reportedly setting up a listening post on one of Myanmar’s islands near the strategic Strait of Malacca.” Read more from indianexpress. Huanqiu Contracting and Engineering Corporation of China has got the contract to build the bunkering facility and tank farm at the Hambantota harbour. Read more from thaindian. It is reported that once Hambantota port is completed, it will trigger international competition to control energy supply routes in the Indian Ocean as China’s 80 perecent oil supplies and India’s 65 percent oil supplies pass through sea lanes of Indian Ocean. Read more from Thaindian News. Many private investors are rushing to invest in Hambantota port. Work on the project by Chinese contractors are proceeding ahead of schedule. 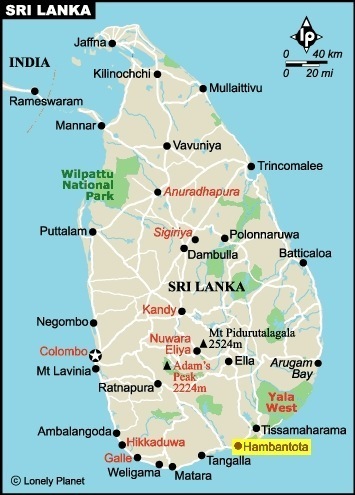 The Sri Lanka government plans to start initially with setting up of storage and sale of bunker fuels, mainly for ships passing the south coast. Read more from PortWorld. A report from U.S. Joint Forces Command confirms that the commercial-shipping container port at Hambantota being built by Chinese contractors is part of China’s so-called “string of pearls” strategy to gain political influence and be able to project power in the Indian Ocean region. Read more from Lanka Business Online. However, China has clarified that its backing for the Sri Lankan Hambantota port and bunker terminal project is for commercial purposes only and not as part of a strategic plan to project its power in the Indian Ocean region. Read more from PortWorld. Sri Lanka is planning to enhance its ship building capacity with the government inviting foreign investors to set up a ship yard at Hambantota port being built with Chinese assistance. 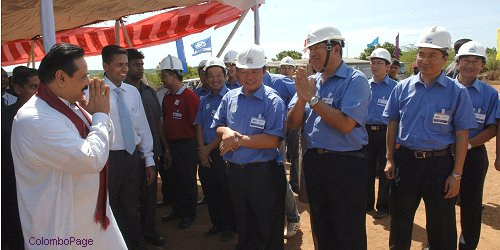 Shipyards from Dubai, India and China may compete to establish a dockyard in Hambantota. Read more from Lanka Business Online.